BBQ accessories are a fun way of improving your BBQ experience. Nothing beats having the perfect tool for the job, be that long handled tongs or a smart new skewer set. We stock the best BBQ accessories from all over the world. BBQ accessories gifts are extremely popular with avid outdoor chefs, so browse our pages to get some inspiration. 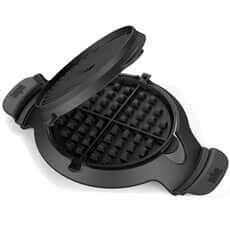 Why not buy a new cooking gadget to challenge the cook? Pizza stones are one of our top selling items, with a pizza wheel or spatula to complete the set. 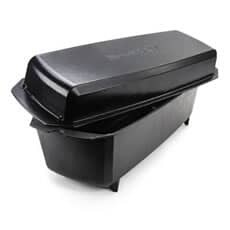 What about a marinating accessory, such as an injector, or a dedicated Rib Roasting Box? Heard of a BBQ meat claws and wing racks? These are just some of the exciting new products you can introduce to your outdoor cooking experience. You cannot go wrong with classic gifts too, such as a really good quality Cedar Cutting Board, from Broil King, or a beautiful set of stainless steel salt and pepper grinders from Weber. 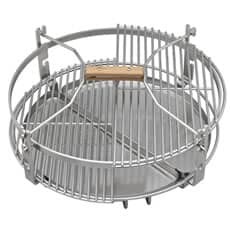 Weber BBQ accessories are amongst the best quality, and we sell their entire range. We have sourced a really diverse range of accessories from across the world with prices to suit everyone. Get kitted out before summer arrives, or treat the keen garden chef in your life. Barbequing has never been so popular in the UK, so make a splash at your next grilling event. Having the right barbecue accessories can turn an ordinary outdoor burger into a full dining experience. 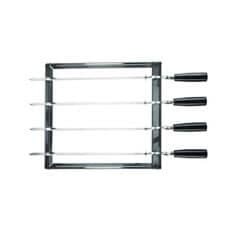 You can buy everything you need to enhance the cooking experience, including a host of utensils that have been designed to make specific aspects of cooking over the grill easier. 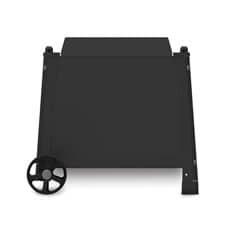 You can buy replacement or additional parts, and you can buy accessories like outdoor fridges that can help create the perfect outdoor food preparation area. 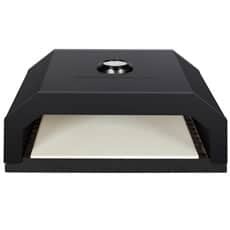 Items like pizza stones enable you to get even more creative when preparing dinner and covers and cleaning kits help maintain your BBQ and keep it in top condition. You can also buy smoke boxes and wood chips to give your gas barbecue an authentic flavour and taste, and you can buy the fuel that you need to power your barbecue. 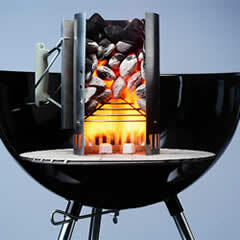 At BBQWorld we have a large catalogue of BBQ accessories, including those mentioned above and many more. We are the official website of Dawson's Department Store, and we are always on hand to answer questions by phone or in person. Alternatively, order today and enjoy free UK delivery on any orders over �. Gone are the days of flimsy outdoor cooking utensils. Buy items like skewers for preparing your food, as well as pizza cutters, and virtually any utensils you would find in a kitchen, for your outdoor barbecue. When buying utensils, consider how easy they are to clean, and whether they are easy to store without them becoming damaged. Barbecue utensils need to be durable and hard wearing, and they also need to withstand the rigours of cooking on a grill over an open flame. We have everything from tool holders to the tools to go on it. Stock up on pizza cutters, flexible skewers, and even an LED torch so that you can see the food you're cooking even under shade. Why not use a basting mop to help apply glaze to your spit roast chicken? Getting the right fuel can greatly enhance the barbecue experience. 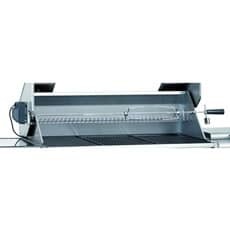 It not only ensures that your food tastes how it should, without the lingering essence of firelighter, but it should also be easier to light, control, and manage. If you do use lighter fuel or fire lighters, choose those that do not taint your food, and let them burn off fully before you start to cook over the grill. Charcoal barbecues offer an authentic taste and experience, but you can benefit from modern and better quality charcoal. Australian Heat Beads burn longer and cook at higher temperatures than standard briquettes. They are also a consistent fuel, which means that they deliver their heat evenly, making it easier to master good quality outdoor cooking. 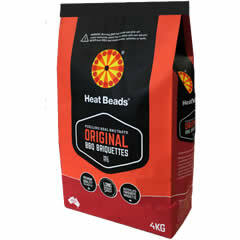 Heat Beads are especially popular for cooking joints of meat, because they allow you to cook for hours at a time and they uniformly cook the whole piece of meat. For everybody that loves to cook food on a barbecue, there's a person that hates cleaning up afterwards. Unless you clean the grill and griddle soon after use, the food and other burned debris can quickly become ingrained and even more difficult to remove. Despite this, it's a job that is put off as long as possible. Cleaning the utensils can be difficult but keeping the barbecue clean is even more of a challenge. Cleaning products include abrasive scrubbers and wire brushes. These are ideal for getting off bigger debris, and then removing some of the finer debris that has become lodged during cooking. 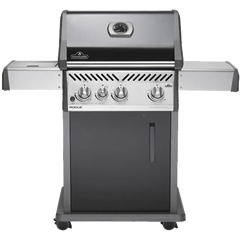 A degreaser can really help reduce the cleaning time, and the range of modern products means that there is a degreaser that is suited to your grill. You can also buy accessories that prolong the life of your grill by preventing them from getting dirty in the first place. 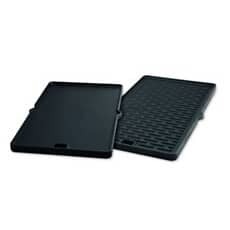 Grate protectors stop fat from getting on the grate, which means that it can't become congealed and solid. 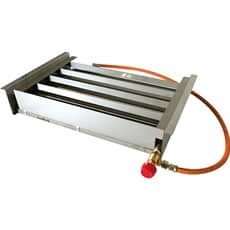 Drip trays can protect the cooker bed, and can be disposed of after use, so you don't have to worry about cleaning them at all. 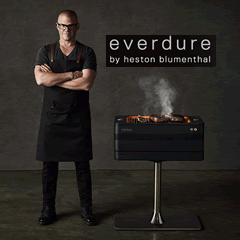 Modern barbecues are built to last. 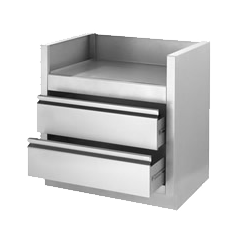 They are made from high grade materials, and they are designed to withstand some atmosphere and weather conditions. However, your barbecue will benefit from being covered during winter months. If you are unable to give your grill a home in the garage, or you do not have a built-in unit with overhead protection, then a barbecue cover is a viable alternative. 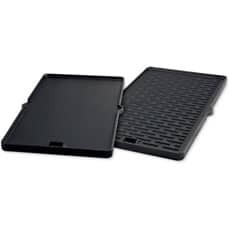 Covers are often available for the specific make and model of BBQ that you have, and these are designed with the exact dimensions of your griddle in mind. They will fit snugly, will not blow off in the wind, and they will protect all the most important elements of your barbecue. Covers are weatherproof and they also stop debris from blowing in the grill. You don't have to be restricted to cooking burgers and sausages on the grill, although these do make up the staple of the British barbecue. With the range of grills and barbecues available, you can cook entire joints of meat, including steaks, but also cuts like lamb legs and whole chickens. A rotisserie slowly turns the chicken, or other piece of meat, so that the whole cut is cooked uniformly throughout. 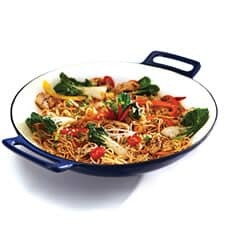 This style of cooking also gives a great finish to the food, and it is popular at fetes and fairs. You can enjoy the same great tastes in your own back garden with a rotisserie complete with its own motor. We aren't all blessed as skilled, outdoor chefs, and even if you are quite capable of preparing great tasting dishes, it can be difficult to keep coming up with new treats every time you get the charcoal out. 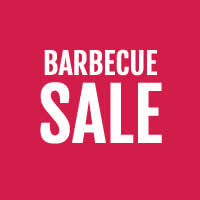 At BBQWorld we have a selection of cook books that are designed especially for the outdoor cook. Wow your guests and amaze your family with some great tasting, authentic barbecue dishes or some modern takes on traditional outdoor food. Gas barbecues are convenient. 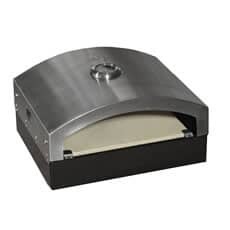 They heat up quickly, provide uniform heat, and they often include more advanced features than their charcoal counterparts. However, some people believe that they lack the same, smoked taste, as is afforded by a charcoal barbecue. Some manufacturers have mitigated this by adding smoker boxes, or you can buy them separately for those barbecues that don't have a smoker unit built in. In a smoker, you can burn wood chips to help create the wood smoked taste of a traditional BBQ. Barbecuing means getting the balance just right so that you don't burn food but still make sure that it is cooked thoroughly throughout. With a barbecue this can be hit and miss, and we tend to either end up burning food or throwing it out because it's still dangerously pink in the middle. With a lid thermometer, you can ensure that the cooking area has reached the desired temperature, while probe thermometers can be used to ensure that meat is cooked at a high enough temperature throughout to kill bacteria and ensure dishes are prepared safely. BBQWorld has a catalogue of barbecues, spares, and barbecue accessories, to help you achieve the best results while cooking outdoors. 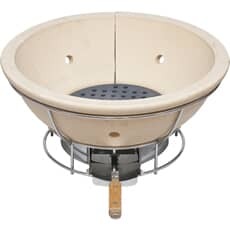 If you enjoy having friends and family round, and you like to prepare food for them, then a good quality barbecue and the right accessories can really enhance the experience for everybody. 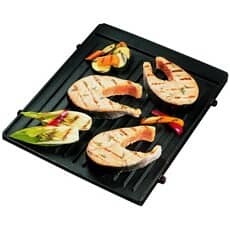 Not only do they help you prepare better tasting food, but the right accessories can prolong the life of your barbecue, make it easier to clean, and ensure that you have a long list of great quality food to prepare. Browse our catalogue, buy through our secure online store, or call in to Dawson's Department Store to view our full homeware and gardenware ranges. Our friendly team are always on hand to answer any questions or queries you have, ensuring that you enjoy a great deal on the best barbecue accessories.